From top to bottom: Takeshi Kitano, Tadanobu Asano, Yuuko Daike, and Zatoichi in action.  Miramax's North American release of Zatoichi is uncut, so supporting it would probably not be a bad idea. The Skinny: 2003 retelling of the classic chambara flicks starring Shintaro Katsu is an entertaining, though somewhat bewildering affair. Takeshi Kitano's mix of iconic characters, routine plotting and infectiously over-the-top rhythm is something which is best experienced and not described. A different, involving and intoxicating bit of genre cinema. Coming your way thanks to Miramax. Takeshi Kitano's reimagining of the classic Zatoichi films is at once sublime and utterly baffling. 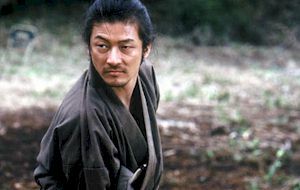 While the film does retain many elements that will charm fans of classic chambara epics (i.e., the original Zatoichi films, or the Sleepy Eyes of Death and Lone Wolf and Cub series), it also possesses oodles of cinema style which only serves to distance the film from its classic roots. Among these elements are the obvious usage of CG blood, and a factor that can only be called "rhythmic filmmaking". The effect can be off-putting, and totally destructive of anything resembling an immersive cinematic experience. Then again, nobody ever accused Takeshi Kitano of doing things the expected way. Kitano plays the titular character, a blind masseuse who also happens to be an insanely skilled swordsman. Wandering the rural roads of Japan, Zatoichi defers to others and is generally unobtrusivethat is, until somebody does something unjust or vaguely disrespectful. Then he cuts loose with furious vengeance via his senses-honed swordman skills and personal walking stick/blade. Zatoichi isn't one to get in your face, but if he knows something isn't right, he's not shy about shedding blood, which he does with surgeon-like precision. Zatoichi's sight-impaired justice comes into play when he wanders into a rural town under the iron rule of a number of gangs. The leading group has hired Gennosuke Hattori (Tadanobu Asano), a ronin who travels with his sickly wife O-Shino (Yui Natsukawa). Gennosuke is a fearsome swordsman who may be Zatoichi's equal, which makes a showdown between the two inevitable. 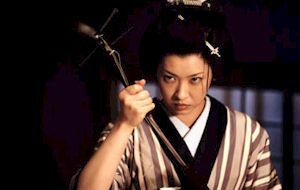 Meanwhile, a mysterious pair of geisha (Yuuko Daike and Daigoro Tachibana) arrive with vengeance on their minds, and the evil gang leaders continue their sneer-worthy agenda. Plus there's gambling, amusing comedy relief, and yes, rhythmic action. We'll get to that later. As a prime example of samurai swordplay action, Zatoichi both succeeds and confounds. It succeeds thanks to cool samurai standoffs and quick, sudden bursts of bloody violence. While the swordplay is not overly impressive, the staging is fast and entertainingly exaggerated, and further enhanced by dynamic sound design. Furthermore, the storyline is decent, solid, chambara stuff that deviates little from the expected iconic characters and situations. Familiar themes of honor, revenge, and justice dot the storyline like required punctuation. 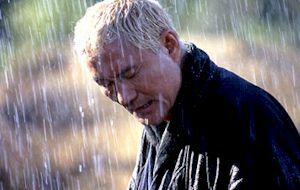 Kitano's Zatoichi is a tough, cool character whose coiled penchant for violence makes him utterly charismatic. All told, there's a lot here to make the fans happy. But then there's the confounding stuff. Kitano uses a lot of obvious CG blood to enhance his action sequences, but the effect is noticeably fake and jarring. Furthermore, much of the film is given to a sense of rhythm that's toe-tapping, but totally outside the bounds of standard genre expectations. In addition to bizarre moments of farmer dancing, there's the balls-out finale involving anachronistic tap-dancing villagers. The sequence is cross-cut with Zatoichi dispensing the final blows of justice, but it's all rather bewildering stuff. By the time characters start morphing onscreen, you know you're watching somebody's planned, somewhat incoherent vision, and not a standard narrative. These jarring blocks of wacky rhythmic action are reflected in the film's structure, which does anything but weave a consistent narrative thread. There's a routine plot going on, but Kitano spends a lot more time on unspoken minutiae than solid plot-driving action. Characters reminisce in the rain, listen intently to the sounds of dice, and stare blankly into space pondering the meaning and/or general state of their lives. We also get dopey villagers deconstructing swordplay, a mentally-challenged neighbor running around with a spear, and long sequences of people drinking sake. The moments seem to stop the film instead of pushing it forward, which could frustrate some viewers. It wouldn't be surprising to find some action junkies wondering why they bothered checking the film out in the first place. Still, viewing Zatoichi as an action flick with typical sword-slashing thrills is the last thing anyone should do. True, Kitano has pretty much broken most of the filmmaking rules an audience (well, a Western audience) would fully expect, but what's left proves cinematically infectious and strangely intoxicating. Kitano breaks up the film into strict blocks of sudden action, iconic character, slapstick humor, silent conflict, and joyous tap-dancing mania. The effect is jarring, but it works in a beguiling, almost bizarre self-referential way. It's clear from frame one Zatoichi is a planned piece of cinema, and not a narrative that's being cooked up to entertain the masses. The action serves its intended purpose, but the characters are portrayed as pieces of a world, and not as players in the expected movie storyline. It's like Kitano wants you just watch the film and not "follow" it like most narrative films require. Basically the viewer should just let the action, music, and anachronistic charm of Takeshi Kitano's Zatoichi wash over them. Fighting it would be a mistake because then you'd totally be disappointed. Simply put, what Kitano has done here doesn't make a whole lot of sense, so trying to make complete sense of it will probably piss you off.